DEAR MAYO CLINIC: I recently was diagnosed with diverticulosis. Are there certain foods I should avoid altogether or specific foods that would benefit my diet? ANSWER: Diverticulosis is a common condition that usually doesn’t cause any symptoms. But, in some cases, diverticulosis may develop into a more serious disorder known as diverticulitis. Research has shown that eating a high-fiber diet may play a role in preventing diverticulitis in people with diverticulosis. Other diet and lifestyle changes can make a difference, too. Diverticulosis affects the gastrointestinal tract. Small sacs, called diverticula, bulge out of the colon wall. This condition is common as people age. Estimates are that about half of the U.S. population over 50 has diverticulosis. Most people have it by the time they are 80. Once diverticula form, they do not go away. Diverticulosis by itself typically isn’t noticeable. Rarely, diverticula may bleed, causing blood in the stool. Diverticulosis often is found during a routine colonoscopy or on an imaging exam, such as a CT scan that’s done for another reason. You can have diverticulosis for years without any complications or problems. 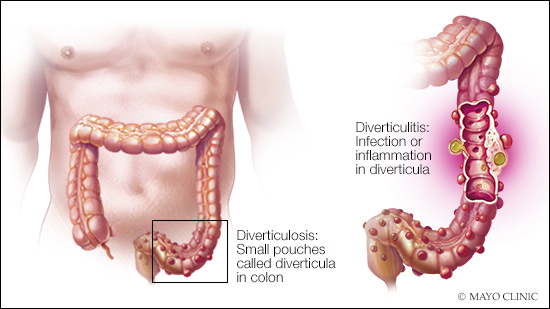 If one or more of the diverticula become inflamed or infected, however, that condition is diverticulitis. While diverticulosis doesn’t lead to discomfort, diverticulitis can be painful. Common symptoms include significant abdominal pain, as well as fever, constipation or diarrhea, nausea, and fatigue. To help prevent diverticulitis, eat a high-fiber diet with lot of fruits, vegetables and whole grains. This type of diet softens waste and helps it pass more quickly through your colon. That reduces pressure within your digestive tract and may reduce the risk of diverticula becoming inflamed. Studies also have found that limiting the amount of red meat in your diet, particularly unprocessed red meat, may decrease the risk of developing diverticulitis. In the past, people with diverticulosis were told to avoid nuts, seeds and popcorn. It was thought that these foods could lodge in diverticula and cause inflammation. But there’s no scientific evidence that these foods cause diverticulitis, and there is no need for you to stop eating them. In addition to modifying your diet, there are other steps you can take to lower your risk of diverticulitis. Maintain a healthy weight and exercise regularly. People who are overweight are at an increased risk for diverticulitis. People who smoke also are more likely to develop the disorder than people who don’t smoke. If you smoke, now would be an excellent time to quit. High blood pressure and high cholesterol can contribute to an increased risk of developing diverticulitis. If you have either of these conditions, talk to your health care provider about ways to keep them under control. Regular use of nonsteroidal anti-inflammatory drugs, or NSAIDs, such as ibuprofen or aspirin, may raise your risk of diverticulitis. But if you currently take an NSAID for another medical condition, don’t stop taking it until you talk with your health care provider about what’s right for you.